This holder turns your spare toilet paper into a downy cloud that floats conveniently on your bathroom wall. 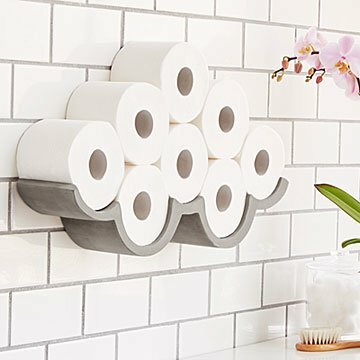 Rain or shine, keep your bathroom stocked in distinctive style with this wall-mounted toilet paper "cloud." Install the concrete cartoon outline to the wall (with included hardware) and complete the cloud formation with a variable stack of 8+ rolls of tissue. French designer Bertrand Jayr enjoys making objects "talk" through visual puns, and this design--part storage solution and part imaginative wall art--seems to speak of the softness obsession surrounding bathroom tissue by likening it to fluffy cumulonimbus billows. Made in China. Click here to see installation instructions for the standard size. Click here to see installation instructions for the large size. Standard: 21.65" L x 3.94" W x 4.72" H; 7.05 lbs. ; Large: 29.13" L x 6.69" W x 3.94" H; 11.02 lbs. Standard Cloud holds 8+ toilet paper rolls, Large Cloud holds 13+ toilet paper rolls. Please note: If sending as a gift,this item ships in packaging that is branded with the product image on the outside of the box. Hanging hardware and instructions included. I like the fact that it holds several rolls of toilet paper. Beautiful but heavier than it looks and probably doesn't have to be. It is made of concrete like stone and attaches to the wall similar to many floating wall items but can be slipped on and off the wall easily. Needs a better re-design on wall attachment. Don't like the movement that remains despite following instructions which were clear and easy. Nice template, nice hardware but poor final fit. Using this over my toilet. It's practical but cute. The piece is not only functional but very witty in its affect. Love how it looks against my Teal wall. It is funky bathroom art. A little hard to hang because it is so heavy. Needs anchors to support it. The template it came with was awesome. Very well made! I have seen this item before and thought it would be a fun piece, so once we re-modeled our bath I decided to add it. Love it!